Note: I will use a sniperized version of Mosin Nagant. It has the top handguard removed, the side rail for the scope installed, and the bolt handle turned down. The disassembly of the rifle is exactly the same. 1) Open the action by rotating the bolt handle up and pulling it all the way back. 2) Depress the trigger and continuing to pull the bolt back remove it from the rifle. 3) Pull the metal bands that hold the top hanguard in place around the barrel up towards the muzzle and remove the handguard. The barrel bands will not come off, so just leave them hanging around the barrel. 4) There are two screws that hold the stock and the rifle together. 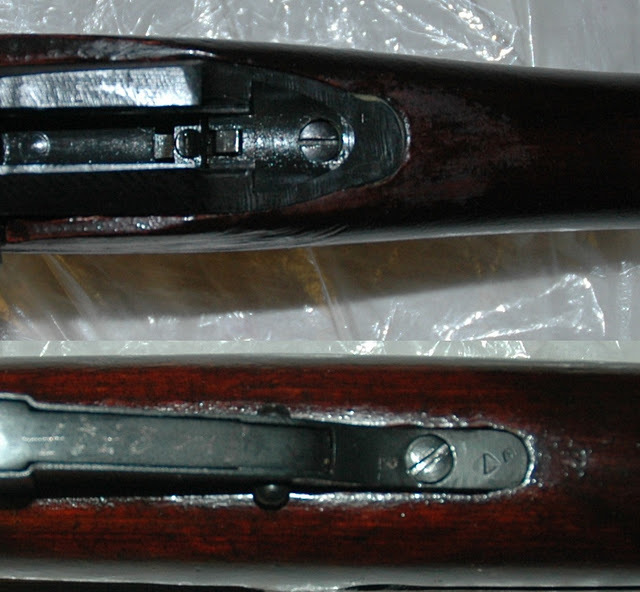 One is at the bottom middle of the rifle, the other is at the top rear of the receiver. Unscrew them and the barrel, the receiver, and the magazine will come apart. 5) For extra credit, you can remove the trigger by unscrewing the retaining screw at the bottom of the receiver, and the ejector from the left side. 6) To disassemble the magazine, press on the retaining lip at the very bottom of it and the floor plate will drop off. 7) On to the bolt. The bolt I am using is a sniper bolt, it has the handle turned in so it does not interfere with the scope. It is exactly identical to an ordinary bolt in all other respects. First, note the notch on the rear of the bolt. It indicates the exact position to which the pin will need to be screwed upon reassembly. Then grab the body of the bolt (the part of the bolt that houses the handle) and the rear part of the bolt, pull them apart sligtly, and rotate the head counterclockwise relative to the body 90 degrees. 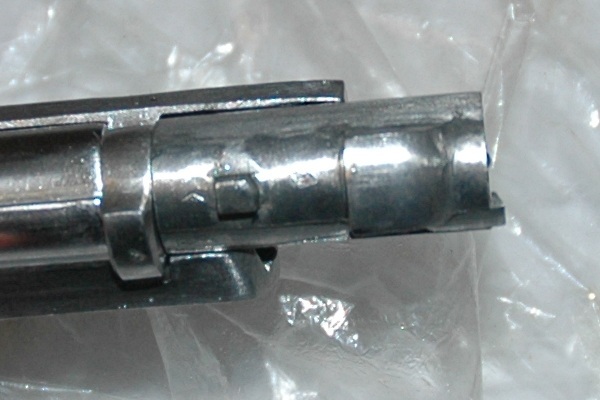 The spring will relax, and both the connector and the bolt head will come off: Before taking the head off, however, note how it aligns with the bolt body - it will help you put it back on. Now take the connector (the longish metal piece with the forked end) and using the forked end against the pin, start unscrewing the pin from the body. DO NOT POINT THE PIN END TO ANYTHING LIVING OR BREAKABLE - when the thread ends the pin will fly out propelled by the spring. Hold on to both the bolt body and the connector tightly. 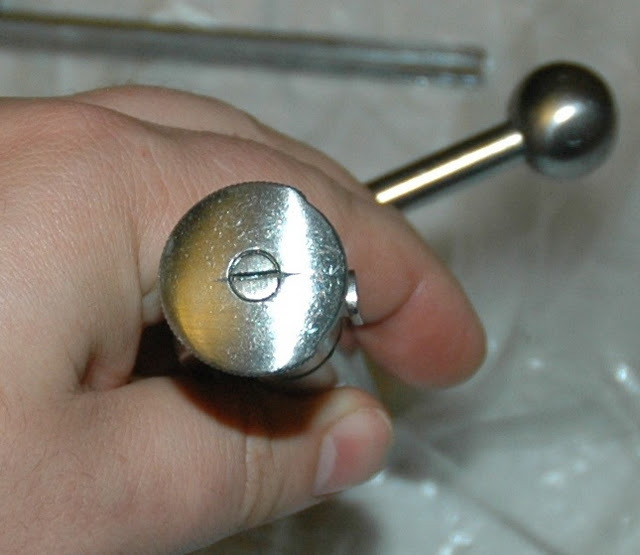 To reassemble the bolt, put together the cocking piece (the part of the bolt with the notch into which the pin screws in) against the bolt body. 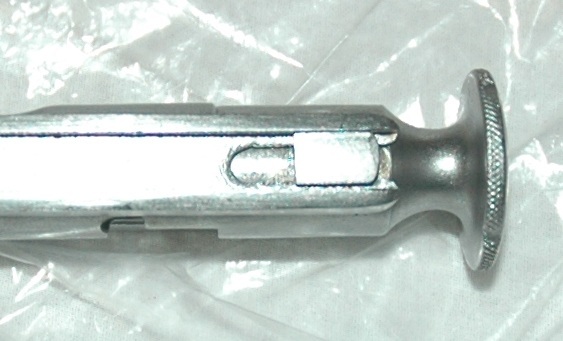 Insert the spring, then, holding the pin by the forked end of the bolt connector, push the pin into the the bolt body and towards the cocking piece. When the end of the pin and the cocking piece meets, rotate it so that the threads engage. Then continue using the connector to screw the pin in until the notches on the cocking piece and the pin align back again. Then insert the connector so that the forking piece aligns with the ledge on the cocking piece. ...and rotate it so that the slots on the body and the head are properly aligned. Now take the cocking piece and the body, and pull them apart while rotating 90 degrees clockwise, compressing the spring and locking the head and connector into the body. Your bolt is back to assembled! After you do it two or three times you will be able to completely disassemble and reassemble you Mosin Nagant, bolt and all, in the space of barely five minutes.